"Many sipes packed into the tread lugs of this tire allow the tire to bite into the ice and snow to deliver exceptional grip and traction. The combination of 3-D and multi-pitch sipes create over 2,500 biting edges throughout the life of the tire. These biting edges increase ice and wet grip for improved winter handling." "The special formulated soft tread compound allows the tread blocks to remain flexible at cold temperatures to improve ride comfort and performance meanwhile increasing snow & ice surface traction and grip. All-season tires can begin to lose performance as temperatures get colder. Specialized polymers ensure the tread compound of the Starfire RS-W 5.0 remains flexible enough to grip and handle extreme winter driving conditions. 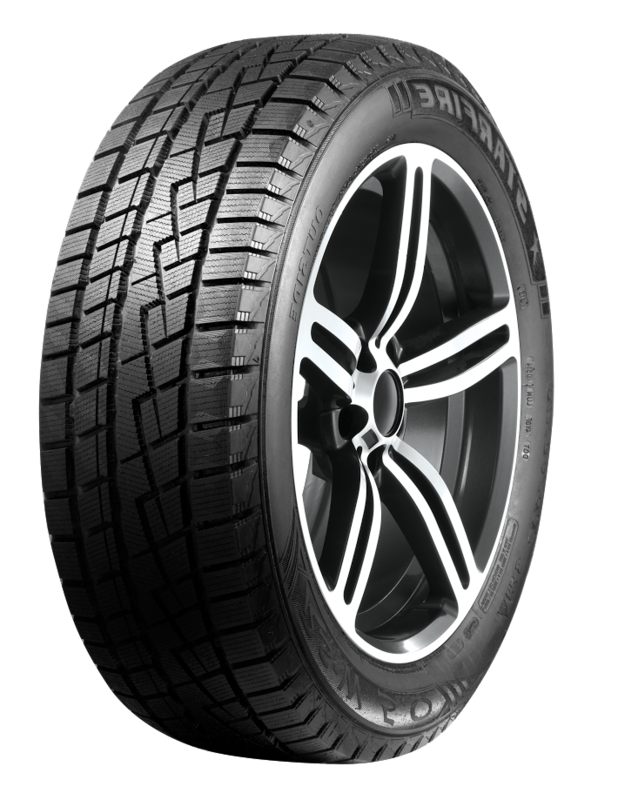 Unlike all-season tires the RS-W 5.0 is able to stay flexible and maintain grip well below -30C." "An innovative elongated triangular buttress on the side of the outer circumferential grooves provide lateral support for handling purposes as the compound is extremely soft. The three circumferential grooves allow the Starfire RS-W 5.0 to pack snow into the grooves to create snow-on-snow traction, much like two snowballs being stuck together. Winter driving can see a variety of conditions so these grooves also serve to evacuate slush and water." The integration of tie-bars in the shoulder ribs stabilizes the outer tread elements giving better handling response while still evacuating slush and rain. By adding chamfers, or bevels to the edges of some of the tread elements this reduces noise and tread “squirm” leading to better handling and treadwear. A new sidewall buttress was designed, carrying over the textured design to aid cornering & traction in deep snow plus a pleasing aesthetic finish to the tire. A patented textured tread surface with fine raised lines provides extra traction & grip on ice. Enhances tread block stiffness for better response and control providing excellent braking and acceleration. Square shoulders provide flat, even pressure across the footprint and support while cornering. Grabs and traps snow for better traction. Trapping snow in the tread creates more traction characteristics of “snow on snow” grip versus “snow on rubber” grip.